At Uber, you could say we’re a little bit obsessed with the future. From a simple idea – push a button, get a ride in minutes – Uber has grown into a global platform powering over 10 million trips every day. We’re humbled to be a part of how people today, all over the world, interact with their cities and with each other. That’s why it’s now time to pause uberPOP in Norway, in order to relaunch under new regulations. We’re incredibly proud of our Oslo uberPOP business, which has reliably served more than 280.000 users looking for a ride and hundreds of drivers interested in making money on their own terms. But to achieve true reform, we’ve decided it’s best to pause uberPOP on October 30, 2017. We will continue to offer UberBLACK and UberXXL. We want to act as a responsible company that cares about all of its users, and we especially want to limit any issues that drivers may encounter on the road. Why pause? Let us be clear: We want to operate within the law in Norway. Since uberPOP launched in Oslo three years ago, there has been a lack of clarity about new platforms like Uber and how they fit into the existing Norwegian model. We acknowledge the importance of these questions. That’s why we’re engaging in a constructive dialogue with policymakers across the political spectrum to find a solution that works for all Norwegians. Momentum towards reform is growing. Norway deserves modernized laws that encourage innovation and competition without sacrificing what makes the Norwegian model special. This is already happening elsewhere: Finland recently passed progressive reforms, and we chose to pause uberPOP in Helsinki in order to relaunch when the new law comes into effect in 2018. Here in Norway, we’re encouraged by the recommendations from the ESA, the competition authority and the government’s own sharing economy committee. The government parties, Høyre and Fremskrittspartiet, have stated in their party programs that change needs to happen in the transport sector. We’re ready to relaunch uberPOP as soon as new rules are in place. Until then, sadly, hundreds of uberPOP drivers will lose access to an important source of income. Supporting drivers is our top priority. We are committed to helping them adapt as the pause comes into effect and, when a new framework is in place, get them back on the road. We’ll have more details about this to share in the coming weeks. 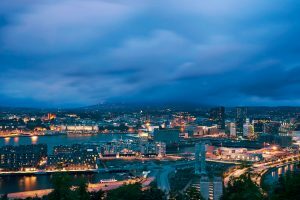 Rest assured, Uber isn’t leaving Oslo – UberBLACK and UberXXL will operate as usual and we’ll stay on the ground to advocate for fair rules that promote more choices for consumers. We hope the government will implement these recommendations soon, so that we can relaunch a new and improved version of the product loved by so many.